One of my favourite September rituals is making a big batch of Salsa Verde. 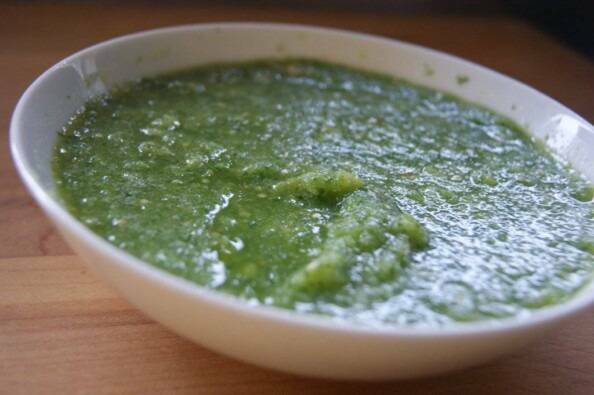 Salsa Verde is obscenely easy to make and yet it has so much wow-factor – it’s bright green, it’s delicious and tangy, it’s very ‘authentic Mexican,’ and it’s made with one the coolest fruit/vegetables I know of : tomatillos. 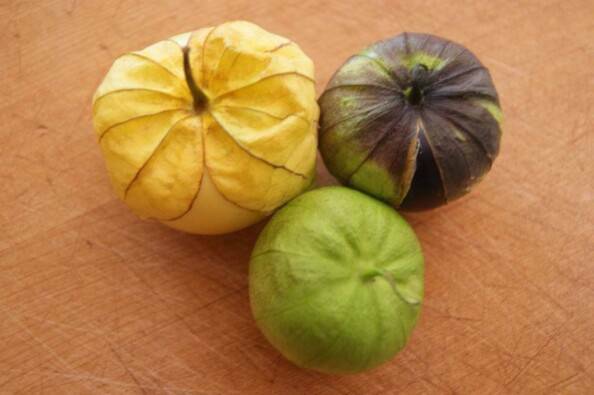 You’ve probably seen tomatillos before. They look like small green tomatoes, each wrapped in its own papery husk. Despite their name, tomatillos are not tomatoey, instead sharing family traits with their sisters, the ground cherry and cape gooseberry . My favourite trait they share is their tangy refreshing fruity green flavour. Tomatillos grow very well in our Southern Vancouver Island climate, hallelujah! You can buy some from your local farmer this week. No matter how they look, local tomatillos taste (to be exact) 12.63 times more delicious than imported ones. They are so much better that sometimes they do not even taste like the same fruit. Now, how to use tomatillos. Having made both boiled and roasted versions, and having tried them side by side, I sit firmly in the Boiling-is-Best side of things. Roasted tomatillos are good, but they lack the fresh greenness of flavour and the bright tanginess that the boiled ones have. Roasted tomatillos taste, well, over-cooked and smoky. I say this with a mild amount of trepidation because roasted tomatillos are de rigeur in most foodie discussions. Roasted tomatillos might taste better eaten plain beside a boiled one, but they do not make better Salsa Verde. So says the Chef. Tomatillo Salsa can be made in huge batches and then canned, or made in small batches to enjoy over the course of a week. In an effort to stay in line with my Operation Use-It-Up resolution, I have opted this September to make small batches frequently and enjoy. With chips, with tacos, with scrambled eggs, YUM. 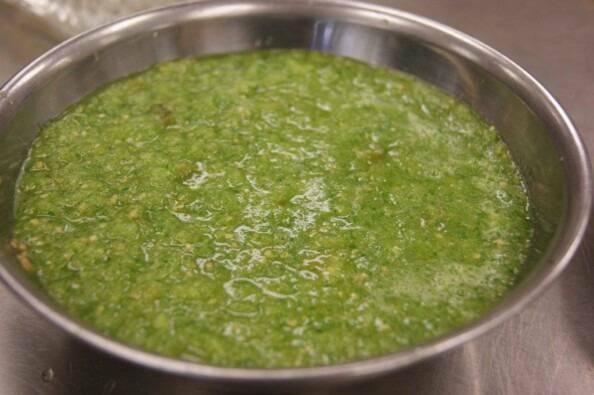 Naturally a bit sour and very refreshing, tomatillo salsa is the green table salsa found everywhere in Mexico. This salsa is delicious used as a dip with corn chips, a topping for tacos, or poured over cooked eggs as a quick meal. 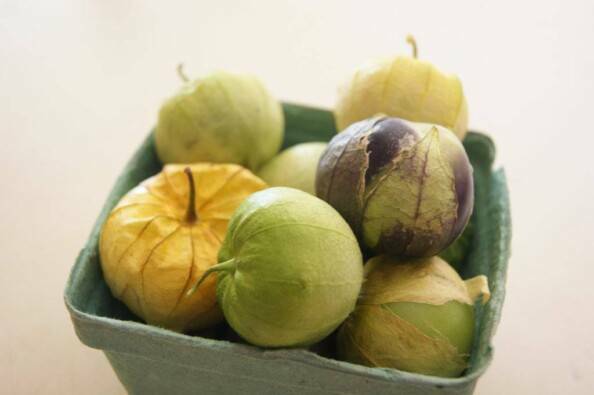 NOTE: To choose tomatillos, look for firm fruits with a dry husk. Tomatillos should not be soft and mushy. 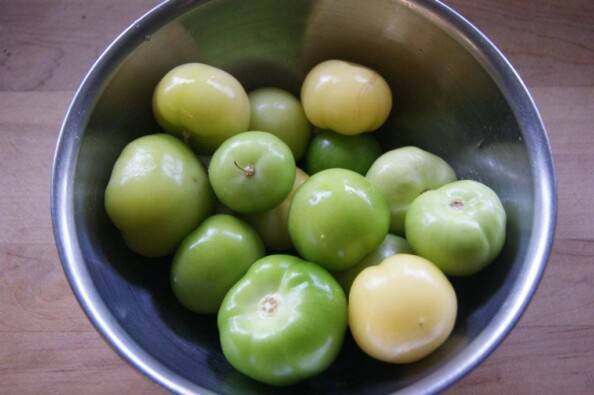 The colour of a tomatillo can range from bright apple green to pale yellow. 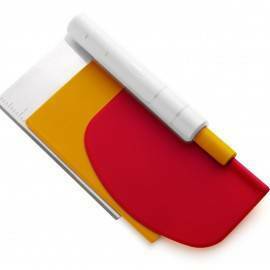 Any colour within that range is fine, although the greener ones are less ripe and therefore less prone to spoiling. Local tomatillos are usually small, only slightly bigger than cherry tomatoes, and often have a dark purple tinge to the husks or fruit. 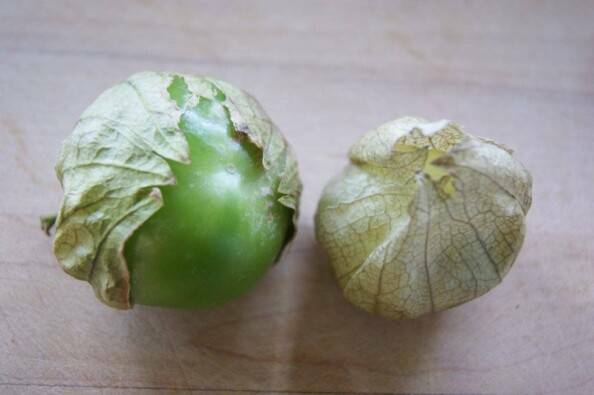 Remove and discard the papery husk from each tomatillo. 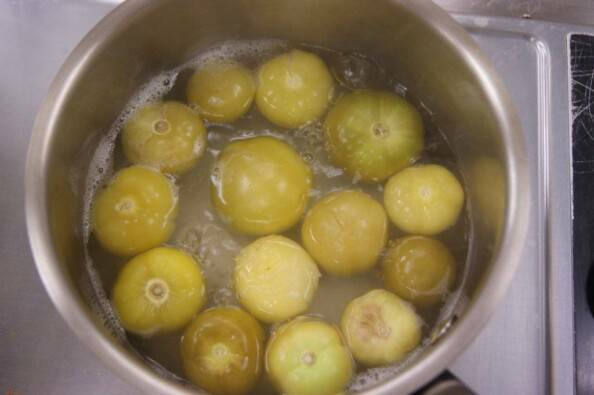 Wash the tomatillos well and place in a small pot with enough fresh water to just cover them. Bring to a boil, reduce heat, and simmer until the tomatillos are tender, about 10 minutes. Drain the tomatillos, reserving the cooking liquid, and set them and their liquid aside to cool. 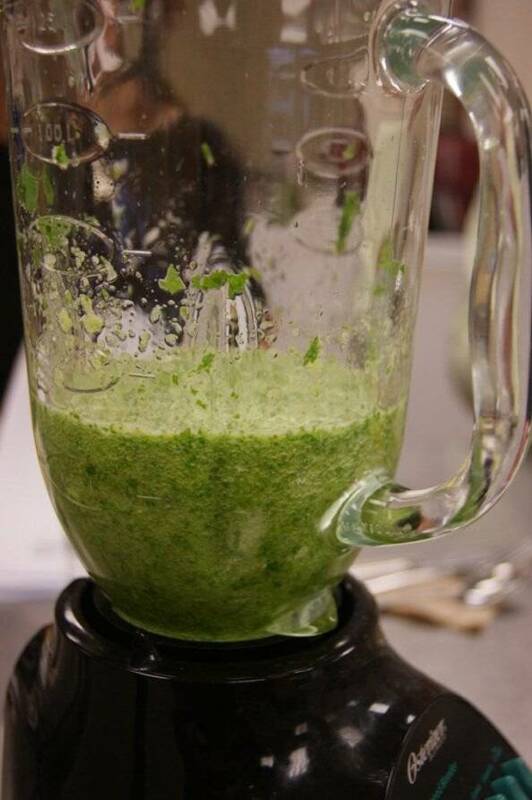 Place the onion, garlic, cilantro, salt and chiles in the work bowl of a food processor or blender. Add one-half cup of the cooled tomatillo cooking liquid. Blend until very finely chopped. Add the cooked tomatillos and pulse to make a coarse puree. Pour into a bowl. Taste the salsa for salt and add more, if you like. Use a little more of the cooking liquid to thin the salsa, if necessary. But it still taste the same – so darn yummy! TOMATILLO SALSA WITH FRESH CORN! Make the Tomatillo Salsa, above, as written. Mix the corn into the salsa and add a bit more salt, to taste. Allow the flavours to blend for 5 minutes before serving. Oh my! This looks delicious. 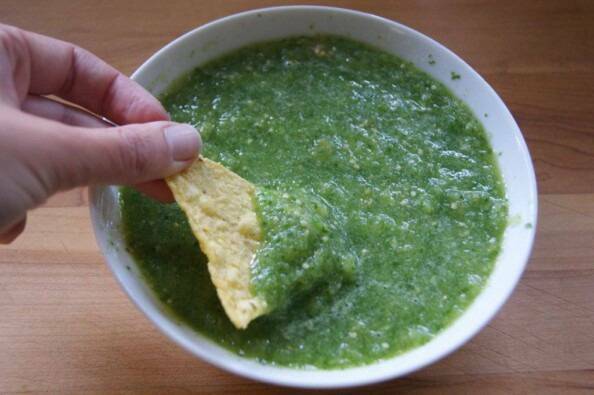 I’ve never seen a green salsa before but would love to try it out. Just finished a batch. Flavor is great, next time I’m adding another Jalapeño (I only used one). Thanks for sharing this! Just finished a batch using a mix of colors of tomatillos. Really great! 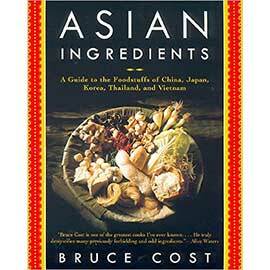 I did adjust a bit for our taste and added a small squeeze of lime, but, honestly, TERRIFIC! 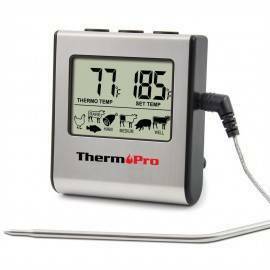 Awesome, so glad you love this recipe! It’s a favourite of mine, for sure.